April is perhaps the very best month in Virginia to catch a sight of these extraordinary flowers that grace the landscape for such a brief time. To be ephemeral is to be short-lived, fleeting, brief. 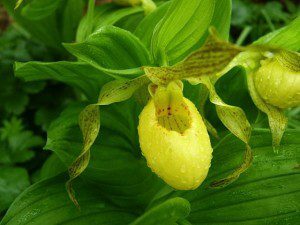 Bluebells, merrybells, Dutchman’s breeches, squirrel corn, trilliums, lady slipper orchids, bloodroot, hepatica, trout lily, twinleaf and toothwort; even their names are alluring, and all come and go in a flash. Bloodroot blooms for only a few days, bluebells’ flowers manage to hang on for three weeks or so, but that’s it. The beauty and mystery of these flowers call out for recognition and now is the time when experts and novices alike take to the trails to catch a glimpse. Where do you go to see them? They are usually found in the woods, in the more rich and moist soils, where they take advantage of the sunlight that reaches the forest floor before the leaves of the trees close the window of opportunity and make sunlight more scarce. 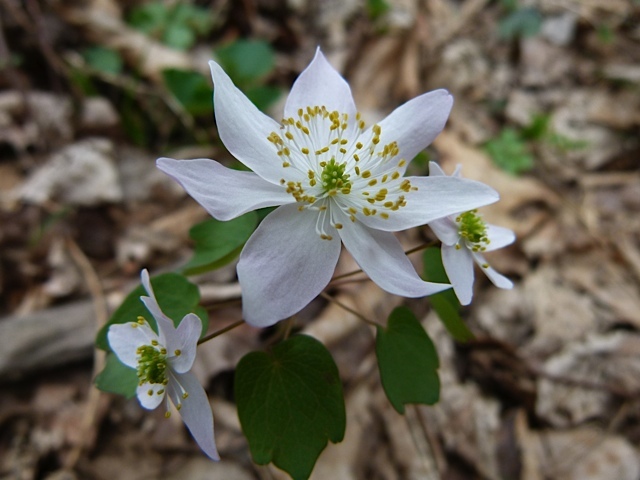 Many of the VNPS chapters are offering wildflower walks this month, take a look at our Calendar and see if there are any you can join. All of them are open to the public and free. It’s fun to go hunting with someone who knows the places to look. 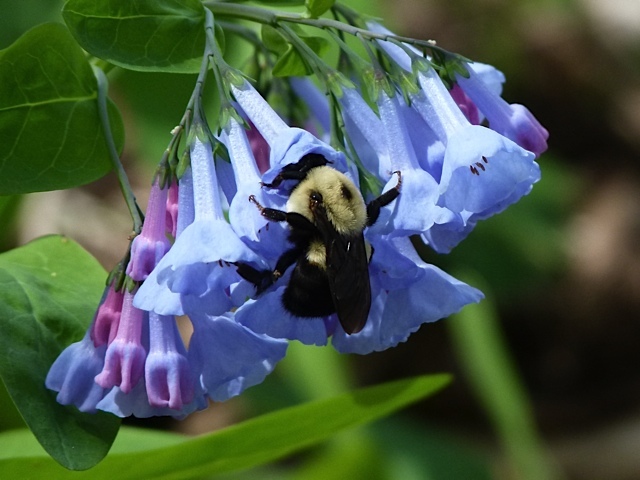 If you’re an expert or an adventurer, here is a list of fantastic places compiled by Christopher Ludwig, Chief Biologist at the VA Department of Conservation and Recreation, in bloom order: Botanical Hotspots. The ephemerals are among the first plants to push up from underground in the spring, and they have adapted so that their life cycles come to completion very rapidly. Most have achieved pollination and seed set to ensure the next generation as the canopy closes overhead. Each of these plants boasts unique adaptations. Some close their flowers on cloudy or cool days, waiting to open when it is more likely that pollinators will be active. Some have evolved structures that permit only one type of bee to have access to its pollen, making sure that their seeds will not be cross-pollinated with neighbors. Several of the ephemerals coat their seeds with a fleshy oil-rich outgrowth called an elaiosome, which ants love to eat. So the ants kindly collect these, eat the elaiosome and then give the seeds a nice protected underground place rich in nutrients where they can wait for spring. Sadly, loss of habitat and over-population of deer are taking a toll on the numbers of these remarkable plants, making the mission of the VNPS more important than ever. The Society takes action to support conservation in many ways. Education is an important focus, from schools to governing bodies. Many chapters also maintain ‘Registry Sites,’ which are places of special importance, some are public, some private. Chapter members actively help to maintain these sites, removing invasives, keeping records, and leading walks. Lots of VNPS members are engaged in restoration efforts ranging in size from small urban parks to National forests. VNPS has also played central role in the new Native Plant Marketing Partnership, started by Virginia’s Department of Environmental Quality. This exciting campaign has initiated a variety of collaborative activities or actions to increase the use of natives, including a sustained effort to work with nurseries which are not currently selling natives. This work deserves a post of its own – coming soon! Go out and catch ’em while you can!